So often we find ourselves caught up in arguments of politics, discussing race and gender, citing articles we have read, or anecdotes we have been told without questioning our personal truths. As Chico’s Brother, Aurelio Villa Luna Diaz rejects this PC banter and academic discourse in favor of introspection in his new album “qPOC…&LMNOP” (available on Bandcamp). This series of songs replaces politics with heart, pushing grand narratives into the periphery in order to locate the personal narrative in the forefront. It must be noted that Aurelio has not broken form from his previous album. Each song is derived from specific experiences. There is a vivid dream, a short history of his father and grandfather, a song for friend who passed away. Each track is personal, an internal struggle, but when converted to music and shared with the world, it becomes something we can all relate to. 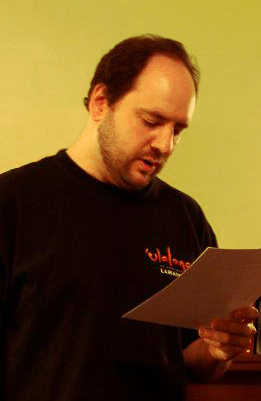 Alan Mathos (a.k.a. Jason Thomas) is a poet, dabbler in short fiction, and contemplator of the peripheral aspects of life that hold hope and hidden meaning. These, he explains, are like rays of sunlight through the cracks of a door in a dark room – a door that remains locked until a key is revealed by one’s adjusting eyes. Themes in his work include spirituality, humor, ghosts, temptation, economics, searching, isolation, nature, music, confusion, and perception (both visual and psychological). In his poetry, Alan enjoys variety, experimenting with free verse as well as structured, traditional, and rhyming forms. According to him, his fiction writing is coming along, but there are “still a lot of orange cones and barrels” as he improves his use of plot, character development, and shifts in narrative perspective. You can see and hear him at occasional open mics in Mansfield, Ohio and in free-range conversations in uncaged coffee shops and other cultural settings.